Main Phase: Exhaust this card to choose a Problem. You need -4 wild power to confront that Problem until the end of the turn. 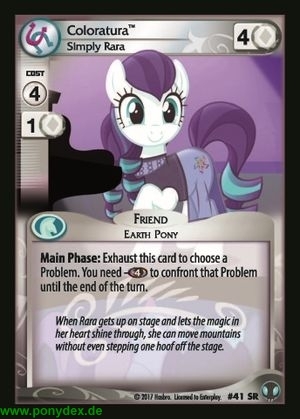 When Rara gets up on stage and lets the magic in her heart shine through, she can move mountains without even stepping one hoof off the stage.